In the depths of the hot-place, souls scream for mercy. Which is seriously annoying. Can't they see that? You, as a master of the underworld, have more important things to worry about than their poor tormented souls. Honestly. Selfish little ghosts. It always seems to be about them. Well, that would explain why they're down here at least. Anyway, we understand that an Overlord of your caliber probably has stuff to do. Torment the betrayers, track down whoever has been stealing your brimstone seasoning, and scratch a few Hell-dog bellies. Busy busy. As such a busy demon lord, you are strapped enough for time as it it. You shouldn't need to worry about your wardrobe when you have more pressing matters to attend to. 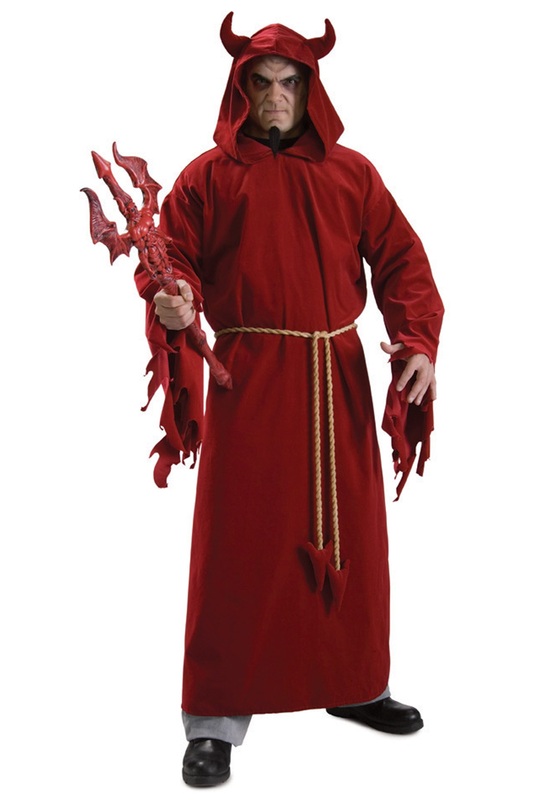 So, as a staple for your wardrobe, we present our Sinister Devil Adult Costume. This piece is all about presentation! And a person in your standing should definitely have a bit of show. This outfit has a red velvet robe with hood. It has raggedly cut sleeves and a rope cord for the waist. And (the best part) the hood has horns. So if you don't have enough time to put yours on when you're rushing out of the cave, you merely flip up the hood and you're good to go. Seeing you in this outfit? Might just shut those slimy spirits up for once.